Is your family excited about the 2012 Summer Olympics? We are! 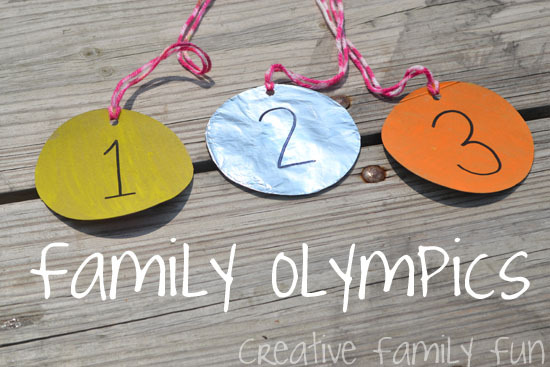 If you’re looking to get in the spirit and celebrate the games, try hosting your own Family Olympics. After only a little bit of preparation, our Olympics were ready to go. Our medals were easy to make. I cut circles from a cereal box out of the recycle bin that we painted. We didn’t have gold or bronze paint, so I used yellow and orange instead. For the silver medal, I covered my circle in aluminum foil. I drew the numbers on with a black Sharpie, punched holes in the top, and strung some yarn through the holes. Nothing to it! Our medals were ready to go. Before the games begin, you’ll need flags. 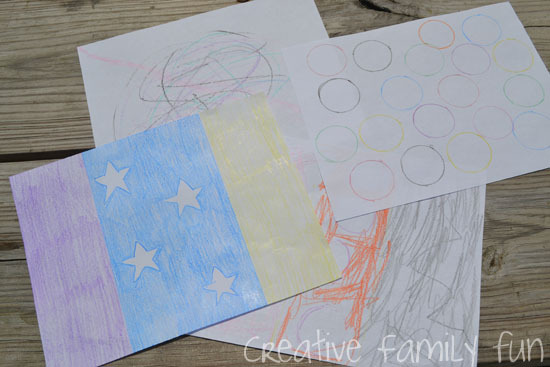 Instead of representing countries, we drew flags to represent ourselves. All it took was paper, a ruler, and a box full of crayons. This is a great time to get started talking about the Olympic games. Talk about the sports, the ceremony, and the athletes. Mom and dad can share stories of their favorite Olympic moments. Use this time to get in the spirit of the games. Once you’re ready to go with your flags and your medals, draw up a schedule of events and have fun. Here are some suggested events for your Family Olympics. Foot Races: Your races can be long distance or short distance. Set up a starting point and a finish line and see who can run the fastest. Have one race or three. It’s all about having fun. Balance Beam: Use a scrap length of wood, your garden hose, or even rope. See who can keep their balance the longest. Can you stand on one foot? Hop? Turn in a circle? Long Jump: How far an you jump? Grab a tape measure and see who can jump the furthest. 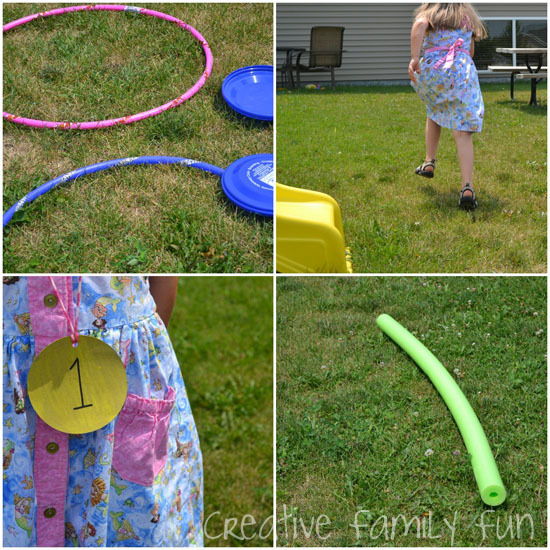 Disc Toss: We used hula hoops for our targets and tried to toss frisbees into the middle. Whoever gets the most inside the hoop wins. If you don’t have hula hoops, make circles with rope or even the garden hose. Javelin Throw: Use pools noodles as fun javelins that are safe and that anyone can throw. See who can throw their pool noodle the furthest. Or, try to throw them in your hula hoop targets. Obstacle Course: Set up a backyard obstacle course. Incorporate your balance beam, add obstacles to jump over or crawl under. See who can get through the course in the shortest amount of time. Make sure and have plenty of water on hand to hydrate all your athletes! Have fun! Enjoy the Olympics and your family at the same time. 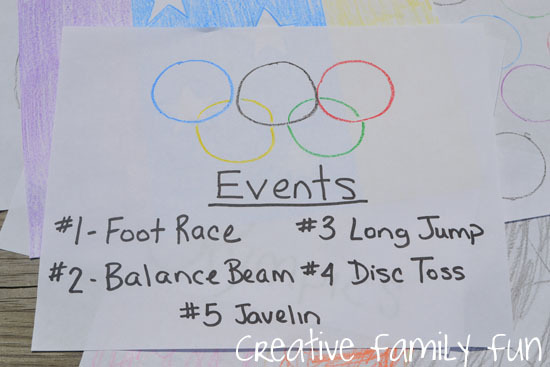 What events would you add to the Family Olympics? This is a great idea for a family fun night! Thanks for sharing at the Sunday Showcase. I'm pinning this to our feature board. So fun! Great events, and I love that you did it as a family. We need to do this! My daughter loves the concept of getting a medal and she doesn't even know what the Olympics are just yet, so she would still have fun with this. How FUN! I LOVE the idea of hosting a Family Olympics to get everyone excited about the Olympic Games. My girls are at the perfect age to get them interested in the games so I am really looking forward it this summer.